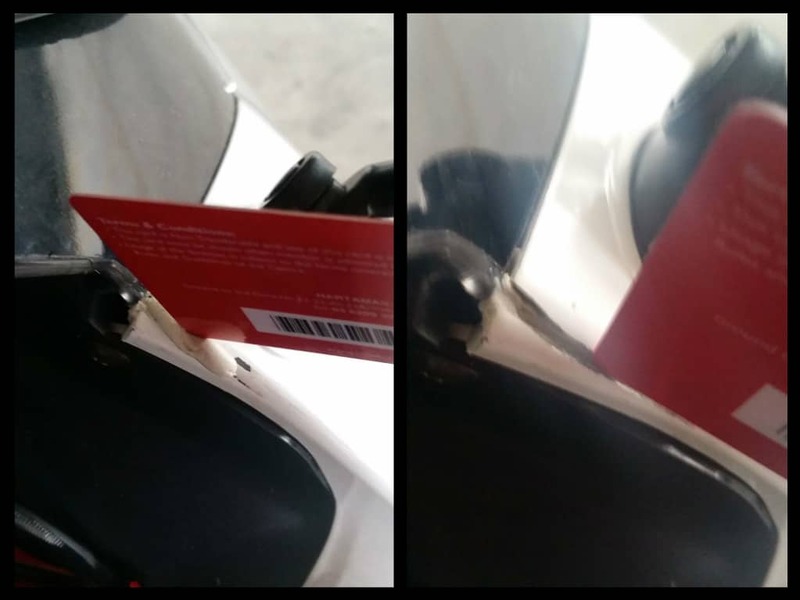 Hyosung / Naza Blade Cracked Fairing Fix – One of the most common problems on a Hyosung especially on the GT650R is their front Fairings. Like or not, I must say this is design defect as the Hyosung fairings can’t take the vibration of this beast. 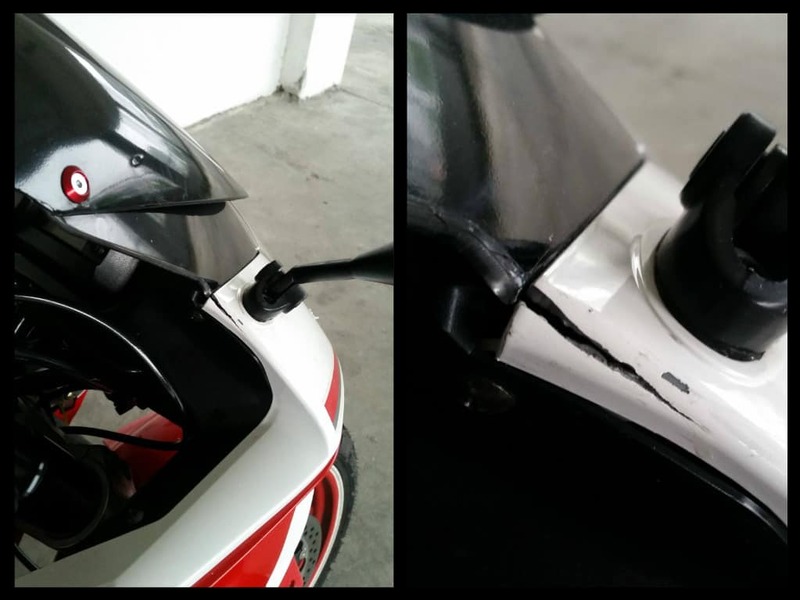 Below is my front fairing which has cracked after 1 year I purchased this machine. Since the cost of replacing or repairing the fairings are expensive, I’ve came up with a Do It Yourself (DIY) plan. You will need to buy Epoxy Putty at your local hardware shop which will not cost you more than $2. Cheap isn’t it? Once you’ve purchased it, simply cut off equal parts of the A and B bars using the ruler on the paper holder as a guide. Note: Prior to mixing the putty, we suggest you clean off any loose debris, grease, oil, gasoline, rust, or dirt. Greasy or oily type substances should be cleaned with a suitable solvent prior to bonding. 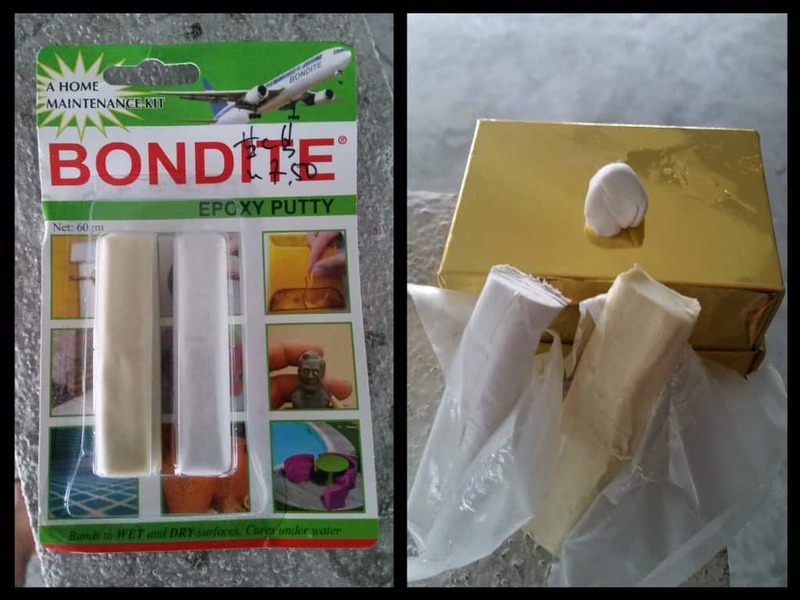 If you are using the putty in a pool, spa or pond repair, clean off any loose materials, algae or slimy substances from the surface. Sanding or roughing up the surface will help improve the putty’s ability to form a tight bond. Next, fill the Epoxy into the cracked area until it is fully filled in. I use a card to ensure it is properly entered and intact. This will also ensure the finishing is clean and not messy. After 24 hours! here is the results! It looks nice and firm. It has been few months now and the fix is still good. You can start fixing your fairings at a cheap price now! What you think? Have your tried this fix? Leave your comments at the comment box below and I will get back to you. You can comment as a guest too! Hopefully the new 2016 Hyosung GTRs will not have this issue as they have revamped the front fairings and I think it looks good too.